The 2014 Product of the Year award winners were chosen from among those products reviewed in SoundStage! Hi-Fi, SoundStage! Ultra, SoundStage! Xperience, and SoundStage! Access. Doug Schneider and Jeff Fritz wrote feature articles about the winners on January 1 in SoundStage! Hi-Fi and SoundStage! Ultra. Integrated amplifiers make a lot of sense. Combining the preamplifier and power amplifier sections in the same chassis can allow significant cost savings over separate pre- and power amplifier combinations. While many high-end manufacturers and audiophiles prefer separates, I usually prefer the simplicity and savings afforded by many integrated amplifiers. 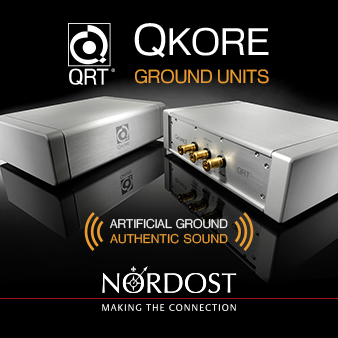 Additionally, many manufacturers are now including digital inputs on integrated amplifiers, including USB inputs that allow a computer to be used as a source to provide a simple and cost-effective system. Here are a few integrated amps that really caught my attention at this year's CES. Anyone who says we're in the middle of a headphone explosion must think it's 2012. What we're in right now is a headphone amp explosion. Everyone from esteemed high-end brands to largely unknown companies is jumping into the market, trying to persuade serious enthusiasts to upgrade and casual listeners to step beyond the sound quality of their smartphones and laptops. Even though CES 2015 didn't see the introduction of a whole lot of interesting mainstream headphones, there was a lot of action in high-end, audiophile-oriented headphones, with several revered brands launching new models and a few interesting new players getting into the market. I've always had a soft spot for companies that sell high-quality audio equipment at reasonable prices -- companies like Cambridge Audio, NAD, and Arcam, for example. I learned, however, that the venerable British company Cambridge Audio will be rebranding some of its products as simply Cambridge, and not Cambridge Audio. I like that: it's straightforward with nothing superfluous, kind of like its products. Normally something like a simple name change wouldn't grab my attention, but when I walked into the company's exhibit room, something else looked a little different as well. After looking closer and speaking with one of the reps, I learned that the company was releasing an entire new line of electronics initially consisting of six components. The system: Two Devialet Phantom loudspeakers and a MacBook. That's it. Doug Schneider wrote extensively about the Phantom on this site last month after he visited Devialet's headquarters in France, so I won't rehash all of that here. The system: For speakers, Magico Q7 loudspeakers ($185,000/pr.) and a QSub-18 subwoofer ($36,000). For electronics, Soulution 701 mono amplifiers and 725 preamplifier, plus a Berkeley Audio Design Alpha DAC Reference and a Baetis Audio Reference Media Server. Cabling came from Vovox. On the first half of Wednesday, the team took off from the hustle and bustle of the Venetian and headed across the street to the Mirage for a few private listening sessions with several companies displaying there. It was quite an experience, starting with the new Rockport Technologies Cygnus speakers! After having multiple Rockport Technologies speakers through my system over the years, I was anxious to hear Andy Payor's latest thinking on loudspeakers, which the Cygnus represents. I surely wasn't disappointed. At this year's CES, headphones didn't seem to be as much of a focus as they have been of late. But still, I found way more new models than I could possibly write about. This article will focus on what I'll term "mass market" headphones, meaning ones that seem targeted more to the average music lover than to audiophiles. Of course, that's a subjective judgment. I'll be filing reports on audiophile headphones and headphone amps once I've had a chance to go through the high-end audio exhibits at the Venetian. The day and a half before CES is packed with press events. Most are put on by such companies as LG, Panasonic, Samsung, and Sony, touting their latest TVs, phones, and other mainstream tech. There's not much audio on display until the show starts, but during the press events I encountered a few new headphones and personal audio players that are well worth a look.